You are at:Home»Governance & Unity News»Governance & Unity Essays»Do Old World Patriarchs Really Want Orthodox Unity? The letter that Archbishop Kyril, Secretary of the Synod of Bishops of the “Russian Orthodox Church Outside of Russia” recently sent to Archbishop Demetrios of the Greek Orthodox Archdiocese of America, as Chairman of the Assembly of Canonical Orthodox Bishops in North and Central America is disappointing. But, it probably should have been expected. Demetrios and his “Committee for Regional Canonical Planning” at the most recent meeting of the Assembly. Stripped of the flowery language, scriptural citations, references to canons, and instances where canons have been bent or ignored, and seeking to deny what everyone knows is the uncanonical condition of the Church in North and Central America by allusions to “situations of genuine canonical anomaly,” the message that Kyril and Danili are delivering to their brother hierarchs is simply that they are afraid to move forward. In a sense, these two hierarchs have done the Church in America a favor. After four years of Assembly of Bishops meetings in obedience to the commands of the Mother Churches issued in Chambesy, Switzerland – they have finally gotten around to expressing what a significant, hopefully a minority, of faithful in other jurisdictions (including the GOA, I dare say) are also afraid of. They see the creation of a united Orthodox Church in America as a threat to their ethnic identities; to their individual (or their parents’ or grandparents’) languages and cultures. Are they really saying that they consider themselves and their flocks to be more comfortable living in Russian/Bulgarian ghettos in America, tied to their “Great Mother Churches” in Moscow and Sofia? Do they want to be “Daughter Churches” of their “Mothers” in the Old Country” – forever? Are they not ready to join the other Orthodox in North and Central America in an administratively united local Church? Part of a single synod of canonical bishops, electing its own head? Are they unable to picture themselves to be a part of an Evangelical Church, answering the Great Commission of Pentecost by bringing Orthodoxy to America while evangelizing their own flocks? Do they and the flocks who have been entrusted to their care understand that when they recite the Creed they acknowledge that they are professing that they believe that they are part of “One Holy, Catholic and Apostolic Church…not an “ethnic society” whose primary goal is to preserve the cultures and languages of the countries they, or from which their parents (or grandparents) emigrated? In other words, are they afraid to be part of a local, autocephalous Church that will take its place as a “Sister” Church with the other autocephalous Orthodox Churches in the World? If these fears and opinions are real, they must be confronted and dealt with. What assurances do Kyril and Danili need that each parish would be free to use whatever language best served the needs of their faithful? What guarantees will suffice to satisfy the fears of these folks that an administratively united Orthodox Church in America will not mean that ethnic foods, dances, festivals and costumes will be banned? What will suffice to allay concerns that recent immigrants who have arrived on these shores from Russia and Bulgaria will leave the Church if the Church in America is united under a single synod of canonical bishops? Clearly, these fears and concerns can receive the assurances and guarantees that can be articulated and made a part of any plan that the Assembly arrives at to comply with the Chambesy directive to bring the Church in North and Central America into canonical order. Is it possible that the questions that the Kyril and Danili letters really raise, have less to do with language and culture than they have to do with Old World politics? At about the same time as the ROCOR/ Bulgarian dust-up, word was sent out that all Antiochian Bishops in Assemblies of Bishops around the world, have been ordered to withdraw from participation because the Patriarch of Jerusalem authorized the establishment of a parish in Qatar, an Arab emirate occupying the small Qatar peninsula; an absolute monarchy with a population of slightly more than two million. Apparently, Qatar is claimed to be within the territorial jurisdiction of the Patriarch of Antioch, which is located in Damascus, Syria. So we ask: “How many Orthodox Christians there are in Qatar? Or, more to the point: Does the future of the Orthodox Church in North and Central America depend on a territorial dispute between the Patriarchs of Antioch and Jerusalem? Isn’t this “Exhibit One” of why the Church in America must become self-governing? The Statement issued by Archbishop Demetrios concerning this “temporary withdrawal” of the Antiochians (his characterization) coupled with his observation that “the particulars of this matter.. have nothing to do with the situation here in North and Central America” means that the work of the Assembly will continue while Antioch and Jerusalem resolve which has “jurisdiction” over Qatar. Which brings us back to ROCOR and the Bulgarian Diocese in the US and Canada. heads of the Autocephalous Churches, from Istanbul to Prague to answer. Ultimately, it a question that Archbishop Demetrios, as President of our Assembly should ask Patriarch Bartholomew. Church of the Czech Lands and Slovakia: Prague, Czech Republic. 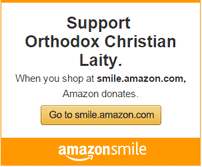 George D. Karcazes is a Chicago Attorney and a Board Member of the Orthodox Christian Laity. As much as I’m for uniting the jurisdictions in the United States so that we meet the canonical norm of “one city, one bishop,” shouldn’t the jurisdictions put themselves in order first? Of the three largest jurisdictions, only the Antiochians have achieved canonical order thanks to the efforts of Metr. Philip and Abp. Michael of blessed memory to unite the two overlapping Antiochian archdioceses that existed here before 1975. 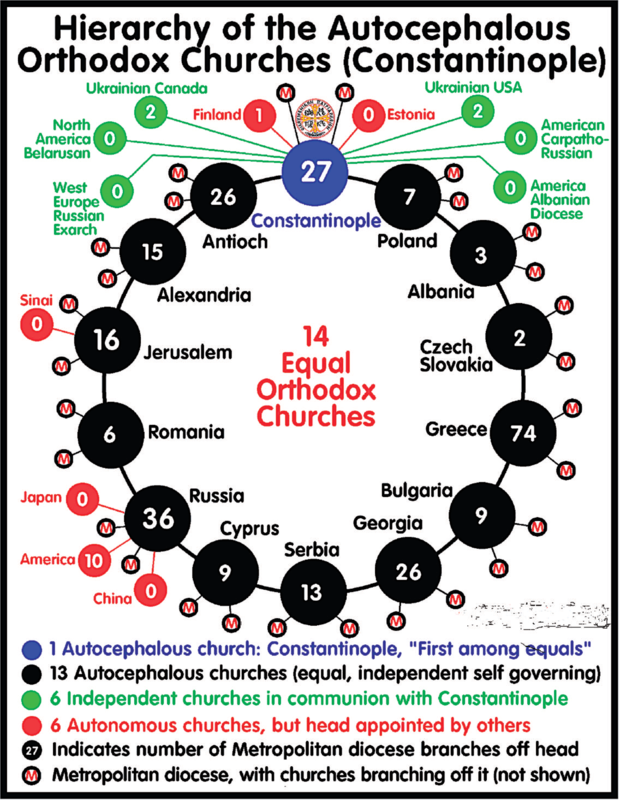 As mentioned in the graphic above, the EP has overlapping Greek, Ukrainian, Carpatho-Russian, and Albanian dioceses while the OCA has Albanian, Bulgarian, and Romanian dioceses that overlap their regular geographic dioceses. How can the efforts of the EP and the OCA to unify Orthodoxy in America be taken seriously when they can’t even unify their own jurisdictions? I was not under the impression that providing bishops for ethnic groups was itself uncanonical. I’m not sure that the ethnic dioceses of the OCA and EP are uncanonical or without precedent. Indeed, I believe that such pastoral provision was made in Constantinople fairly early, no? did nothing to give the ethnic archdioceses any confidence, but that’s all in the past. being the Albanian diocese head. Ridiculous!!!!! Perhaps the Orthodox Church in America (OCA) will put its own house in order, directly or indirectly, in response to its 18th All-American Council (18AAC) scheduled for 20-24 July 2015 in Atlanta, GA. Among the items under consideration for the agenda of the 18AAC is a new mechanism for funding the central church administration, which will most likely require amendments to the agreements between the OCA and the “Mother churches” in the Old World concerning the “ethnic dioceses” under the OCA. As it current stands, the agreements that brought the “ethnic dioceses” under the OCA limit the support the “ethnic dioceses” must provide the OCA to amounts far less than the regular diocese of the OCA must provide the central church administration. I would like to point out a few small errors in your chart. First, it makes it seem like the Ecumenical Patriarchate of Constantinople is a different kind of an autocephalous church than the other ones. In a way, that is certainly true as Constantinople as the first-among-equals does have some prerogatives that no other local church has. This is reflected in the title that could nonetheless mislead a casual reader to think that Constantinople is the spiritual leader of the Eastern Orthodox churches across the world. Furthermore, as you must be aware, Constantinople’s claims in accordance with Canon 28 are not universally accepted, to say the least, leaving the ecumenical sphere restricted to the old Ottoman ethnarchy (minus Antioch) and Her overseas exarchates. Second, the Orthodox Church in America is an autocephalous church and recognized as such by roughly a third of the other autocephalous churches, the first being Her mother church, the Patriarchate of Moscow and All Rus that contains the largest number of members. Third, if the numbers in the circles are meant to display the number of hierarchs, it should be pointed out that in the Greek and Greek-influenced churches a diocesan bishop is called a Metropolitan, while in the other churches they remain bishops. Thus, the Russian Church has quite a few more bishops (207) than any other church. At the other end of this scale, there are many Metropolitans of Constantinople who rule of titular (empty) sees. no higher or better than any other Patriarch. Quit trying to be the Pope of the East! And I, for one, would like to be there when Archbishop Demetrios asks the Patriarch if he was serious. -Romania,Bulgaria and Georgia are Patriarchates not only Churches!!! I do not follow the intricacies of ecclesiastical politics, but I find this article such a breath of fresh air. It must be possible to move toward the emergence of an American ethnic Orthodox Church, in a way that remains faithfully Orthodox, offends the fewest people, respects as much local tradition as possible while maintaining a recognizable Orthodox identity, and is as welcoming and accommodating as possible to people like me (Canadian, now American, with an Anglo-Saxon background). Having seen other groups (Episcopalians come to mind) destroy themselves partly by accommodating an anti-Christian culture and partly by running roughshod over others, I appreciate the desire of Orthodox to maintain unity and peace. Of course, this cannot be an excuse for shoring up ethnic identities only out of fear that one will lose one’s identity in something unfamiliar. Amen, Chris. I like the way you think about this. This is a reasoned common sense approach. I hope that cooler heads prevail and that we get an American Orthodox Church which will be for everyone. 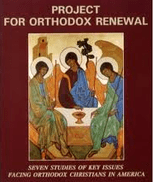 Though the article is well thought out and written and this writer agrees with its contents, the list of the various Orthodox Churches is sadly wanting: there are the autonomous Churches to be considered (which should be totally autocephalous and not controlled from other countries) as well as the so-called “non-canonical” but fully Orthodox Churches of Ukraine, Macedonia and others which should be mentioned. Many of us have had enough of the discrimination against these Churches just because the so-called “canonical” Churches refuse to recognize their existence and validity. Unfortunately, many of the “daughter” Churches in the USA and even the OCA, following its Russian mentor, have fallen into the trap of “canonicity,” giving it a papal, non-Orthodox interpretation. One hope that such nonsense can be avoided in what will inevitably happen: a united Orthodox Church in the Americas which will include ALL Orthodox believers in each country. These old world Patriarch’s will have a very hot corner of hell to debate these issues for eternity. And really, does the author not understand that Yugoslavia has not existed for many years now….simple fact checking of editorial review or proofreading would not make you folks look as incompetent as our church “leaders” show themselves to be. I suspect that those who have speculated as to the reasons why the “Old World” church leadership here in North America is getting cold feet are focusing on the wrong likely causes. I rather think the reasons are more personal and venial: the hierarchs’ fear of losing their “jobs”, and their power. After unity, who would become “The” bishop of New York? Of Chicago? Of Toronto? etc., etc. What would happen to me if I am not “The Bishop”? All of a sudden, most present Bishops in North America would be come superfluous. Unless and until the Assembly addresses this very real “political” problem (life-long tenure and new “jobs” for all existing Bishops? ), we will never have unity here. There should be a bishop for each state in the US. Plenty of jobs for everybody!! supposed to be living and instead have gotten all into a Monarchical Episcopacy. Question for George D. Karcazes: By what authority do you put the Patriarchate of Jerusalem in ISRAEL? Our Orthodox and other Christian Palestinian brothers and sisters will not appreciate your cavalier attitude. As a matter of FACT, the seat of the Patriarchate is physically located in the Old City in occupied East Jerusalem. There are enough problems in the ‘Holy Land’. The OCL ought not to add to them. The problem with this article is that promulgates the ethnic ghetto myth. The reality is that this is a failure on the part of the Patriarch of Constantinople. He could have taken a back seat and allowed each Episcopal Assembly to arrange itself as it sees fit. Instead he insists on the Dyptics which put his bishops squarely in control of the entire process (never mind recent claims that have come out of Phanar that are an over reach and neo-papal). In short this has been nothing but a naked power play. So while it is deplorable our cannonical situation is not rectified, I applaud the ROCOR, Bulgarian, and Antiochian bishops for pulling out. What whoever came up with this article is missing two important points: 1) outside the Greek Archdiocese, there are few Orthodox who want to be under the jurisdiction of the Phanar in the US. Patriarch Bartholomew is NOT the “spiritual (or any other kind …) leader of the world’s 300 million Orthodox Christians.” And no one except the Phanar and Rome wants him to assume the position. 2) Orthodox Christians are not really comfortable with an Orthodox Hierarch who seemingly spends more time with Roman Catholics, Protestants, Muslims, Jews, and engaged in ecumenical nonsense than he does with the Orthodox. If he likes that company better-swell! Unite with Rome tomorrow! You keep telling us “we’re the same!” – what’s holding you back? What’s that? Oh! The Pope is pushing your “Primacy,” and wants you to wait ’til you convince us of that, so you can “order” the entire Orthodox Church to go under the Pope with you? Uh … I wouldn’t hold my breath! The “Assembly of Bishops” is simply a means with which the Phanar hopes to capture the “diaspora.” Not many are buying it! Sorry! Not many ever will! Patriarch Bartholomew recently announced he wanted to limit Mount Athos to 10% “non-Greek” monks. If only he would be as phyletistic with those he wants to “rule,” things wouldn’t look so grim. Lorenzo-an organization presided over by a defrocked and married “bishop” is by no means a “fully Orthodox Church .” And somebody said the “M” word? In a predominantly Greek forum? And … No 10,000 word essay on Alexander the Great?